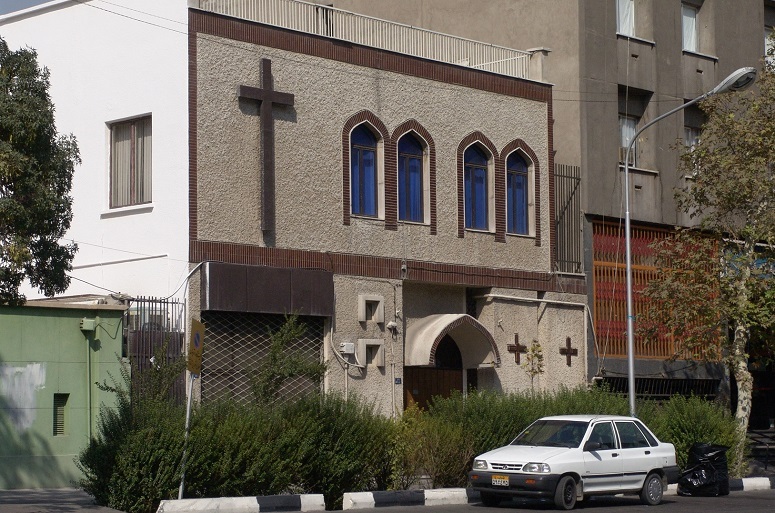 The Central Assemblies of God Church in Tehran was closed in 2013. Over 90 European and US faith leaders have signed a petition urging Western governments to make the plight of religious minorities central to any deal with Iran. The letter comes ahead of the annual Iranian opposition rally in Paris tomorrow (1 July), where tens of thousands of Iranians are expected to gather in a call for freedom. In their petition the signatories from the United Kingdom and the United States join former Archbishop of Canterbury, Rowan Williams, to “stress the ‘harassment and persecution’ of Christians in Iran under ‘the ruling theocracy’,” reports Christian Today. They call on Western governments to help end the oppression of religious minorities by making it a precondition before any deal with Iran. President Rouhani addresses a press conference. Under his government the rights of religious minority groups have not improved. “The situation of religious minorities has deteriorated in recent years, including during the tenure of President Hassan Rouhani. Scores of Iranian pastors are languishing in prisons solely for their beliefs,” they say, adding that children’s textbooks encourage hatred of Jews for taking Muslim lands. “Free Iran” has become the rallying cry for freedom of tens of thousands of Iranians in a “response to the need of the Iran crisis”, wanting to address issues of terrorism and extremism in the name of Islam, as well as seeking a new approach to the theocracy rule in Iran. The “Grand gathering for freedom” is supported by leaders from Europe, the Middle East and the United States. For the young Iranians who decide to become Christians, it’s often impossible to discuss these issues face-to-face with peers. They can’t obtain Christian books and sometimes don’t even have their own Bible. They live lonely lives, as their need for secrecy makes it almost impossible to get together with other Christians, as there’s always the risk of being reported and arrested. During a recent training seminar in the region, the youngsters who attended visibly enjoyed being in the company of others in the same situation as them. They shared the joys of life and also the lows: the persecution, discrimination and even violence they run into day by day. “I don’t know any other young Christian in my city,” said 23-year-old Marjan*. Aref’s church consists of seven people who meet each week at one of their houses. For the music teacher, who is 25 years old, “it is a dream to one day make music and sing in a church building”. Christians are thought to make up less than half of 1 per cent of Iran’s roughly 80 million people, although precise numbers are difficult to determine. The country is eighth on the Open Doors 2017 World Watch List of the 50 countries where it is most difficult to be a Christian. At least 193 Christians were arrested or imprisoned in Iran in 2016, many of them converts from Islam. Earlier reports by World Watch Monitor show that under President’s Rouhani’s government the treatment of Christians, especially converts, has not improved.